Manchester Students for Sensible Drug Policy’s second year has been hard work, but enjoyable. We have gained members, developed leaflets, posters, and other materials, and held events, training sessions, stalls, and socials. We have succeeded in holding some kind of meeting or event almost every week of term, with varying degrees of success. Our greatest success this year has undoubtedly been the campus-wide awareness of SSDP and what we do. The number of emails I have had regarding the society has been steady and we have gained a number of new members through the union website membership form, so they must be finding us somehow. We have also been approached for numerous joint events and support, and it has been extremely heart-warming to stand on a stall and have 1 in 10 of the people we talk to already on the mailing list or who have attended one of our events. I hope we can continue this awareness raising next year as well. Our greatest failure has been an inability to get together promotion on time. Although an improvement on last year (we actually managed to produce posters this year), our inexperience and somewhat chaotic approach led to a very haphazard promotion strategy which did not pay off well. We have experimented with new methods of promotion, including Facebook ads and will continue to do so. Our primary goal as an organisation next year is to get this sorted. Throughout the year, we have held a wide range of events, alone and in collusion with others. It seems likely that we will continue some which have now become fixtures in our calendar, such as a termly film showing with Openmedia and a presence at Pangaea, and some will be rethinking in order to be more successful. 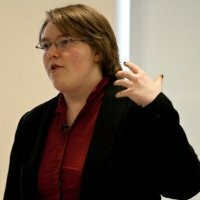 Also throughout the term, we have put forward a motion committing the union to campaign on drug law reform to most General Meetings; this was never debated due to a failure to reach quorum this year – however, the effort we put into promoting the motion has resulted in several SSDP activists coming to General Meetings, which has been excellent. This term we launched our newsletter, “War on People”. Although a great success among those who read it, its production severely overran the budget allocated to it and although we sold advertising to another society, Free Culture, our print run of 200 copies still cost £300. Copies have been distributed to other chapters all across the UK, and have been popular. Having learned from the lessons of our first attempt, we will be producing our second issue in time for Freshers with a view to going half-termly. Also this term, we held two awareness weeks. 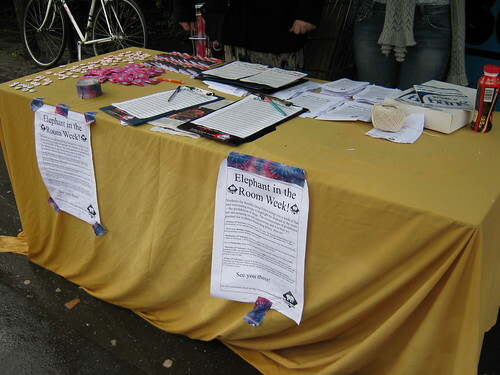 Elephant in the Room week was our generic week to raise awareness of drug law reform. Although struck down by numerous problems and the unexpected cancellation of our main speaker, it was nonetheless quite fun, and we received extremely positive feedback from those who participated (although people were near unanimous that the name must be changed next year). Mephedrone Week was hastily organised in response to the criminalisation of mephedrone in April. Largely organised entirely by our Events Officer, we held some stalls, gave out leaflets containing information and safety advice on mephedrone and held a talk at the end of the week with a local speaker from Lifeline on the topic. It was low-key, but I think very successful. Things left over from last term: the drugs guide is now complete but has been awaiting legal approval for some months. If anyone has legal expertise on drugs, we would be very, very grateful for a proofreader. The first aid workshops ground to a halt because of the convener’s commitments, but we have found a new teacher for next year. We are also planning to push ahead with our schools programme, hopefully through gaining and training volunteers through the Manchester Leadership Programme, although that is a very tentative plan at the moment. This year we recruited nearly 250 people onto our mailing list at Freshers Fair, and have been signing people up throughout the year. Our current mailing list is just under 300 and our Facebook group just over – allowing for overlap I would say that it is not unlikely that we are in regular contact with about 400-450 people through email, Facebook events, and stalls, which puts us somewhere in the top 40 student societies at UMSU. This is somewhat lower than I had anticipated in my interim report – however, the larger part of this can be put down to the accidental loss of over 80 email addresses at the January Pangaea stall and misplanning for Elephant in the Room Week which led to much shorter stalls than intended. SSDP was also much more active this year in involving other people, although we did not achieve as much as we would have liked to in this area. Our Executive expanded dramatically from four to fourteen, although it must be admitted that some roles we created have not been as useful as we hoped and these have been duly scrapped. We’ve had greater commitment from a larger pool of semi-regular activists, several of whom have come from outside the main friendship circle of the society, which has been very gratifying. We have, however, accidentally lost several other potential members because of insularity and this is also something which should be addressed next year. Our demographic remains broad, with a good mix of first, second and third years, which bodes well for our future. I have tried hard to ensure that financial hardship is not a barrier to participation in SSDP, but we have much further to go in that respect. This year we achieved full funding of £750, as well as claiming £270 in the first semester for first aid equipment and £300 for newsletters in the second. We have so far spent approximately two thirds of our regular budget, and one of my remaining tasks as Chair for this year is to invest in more materials for Freshers and other items with a view to next year. In terms of equipment, this year we have acquired a projector to avoid the exorbitant costs of hiring union equipment, and have also bought a table and a gazebo. We also have access to a bike trailer, trolley, barbecue, megaphone, and numerous other pieces of equipment that will come in handy next year. We are also very rich in resources. We currently have several thousand badges for Release and SSDP UK, numerous “nice people take drugs” wristbands, a wide selection of harm reduction literature and a reasonable supply of everything Transform has ever written. We also have in stock nearly a thousand condoms for future distribution on stalls. We do need to get more stickers, banners and develop a new leaflet, but this will happen. We will also need to get a new batch of Release bust-cards, as we get through hundreds of the damn things faster than a new-forged sword through a pat of butter. I mentioned in my interim report that I intended to continue to decentralise the work required to keep Manchester SSDP running. This process continued this term, with our Events Officer Andi Sidwell taking on most of the events-related work this term, which they organised with great aplomb. Kudos also has to go to our newsletter editors, Alasdair Sladen and Luke Taylor, for the hard work they put into producing War on People with very little input for me (though perhaps I should have had more input into the budget… :P). Thanks also to our Treasurer and Secretary, Jesse White and Robi Folkard, for their quiet but consistent contribution to our organisation. James Jackson, our Promotions Officer this year, didn’t do a lot as Promotions Officer, but has turned up to most of our stalls, put up a great defence against the Debating Union in our joint event with them, and gave a popular workshop at our training weekend on Stop and Search powers. Our stalls this year also could not have happened without the hours spent on them by everyone above and Mo Saqib, Benji Starr, Ste Monaghan, Miles Battye, Jess Bradley, Dan Fahey and Chris Loh. I may be amazing, but without everyone helping out this year we simply wouldn’t have got as much stuff done. As Chair, I have continued to handle the majority of our paperwork, correspondence, communication work and interviews. I have tweaked the design of the weekly email and developed our Facebook group to be more useful. I also organised an activist training weekend which saw 7 different chapters represented to learn about running a chapter, campaigning, and effective tabling. I have continued to contribute to the long-term strategic planning on the national organisation in my capacity as a member of the Board of Directors, and recently published a 6,000 word three part guide to Running an SSDP Society, with the third part due to be published in February next year, as well as developing an activist tool-kit with a variety of resources that I have developed and acquired during my time as Chair. In my remaining months in office, I will be finishing off the remaining business of our society this year – ordering materials, writing cheques, and re-registering the society and booking our Freshers’ stall. Along with Andi, I will be conducting soon-to-be-entitled-something-other-than-the-somewhat-scary-sounding-performance-reviews with all our regular activists to get more detailed feedback on how our membership feels about our direction and where they want to contribute. It is a time-consuming process, but a very rewarding one. Together we have been writing an SSDP Year Plan 10/11 which collates all the feedback we have received from the ongoing evaluations over the past year to ensure successes are repeated and failures overcome. This will be followed by an ubermeeting to plan our calendar for next year, which I believe Andi wishes to be open to all who wish to participate. And finally, I would like to organise a summer social over July/August for any activists left in Manchester before we start badgering people to stand on Freshers’ stalls. I remain, as ever, open to the interests and suggestions of our membership. Our society has been largely built upon the systematic nicking of ideas from every society, organisation and individual willing to offer them, and I believe we have benefited greatly as a result of the mistakes and knowledge of others. Long may it continue. Who are Re:Vision Drug Policy Manchester? He shoots, he scores! Oh, what an own goal! GBL and the politics of drug policy. I hope it is okay if I mention that we are now taking on banner accounts. Previous post: Why wouldn’t you want to be autistic? A response.